Politicians love to shake hands with their constituents. It’s basically half their job. But over the past two decades we’ve seen the rise of a surprising new constituency that they need to engage with a firm handshake: Robots. Robots can’t vote. Well, not yet anyways. But that doesn’t stop politicians from posing with robots as if they were any other voter. Admittedly, some politicians look more natural with robots than others. But it’s not always the ones you’d expect. So today we have photos of politicians shaking hands with robots, ranked from worst to best. These politicians were scored based on confidence (you can’t let a robot see any sign of weakness), on style (robots appreciate good form in a handshake), and on the likelihood that this particular interaction might start the robot uprising. Asimov help us. As the Terminator, former California Governor Arnold Schwarzenegger is certainly familiar with robots. Which is why this interaction at a German tech conference in 2009 is so painful to watch. It’s a miracle Skynet didn’t become self-aware the moment Arnold awkwardly did whatever he’s doing in this photo that’s supposed to pass as a handshake. You can see the disdain on Canadian Prime Minister Stephen Harper’s face. Or maybe it’s confusion. Either way, it’s not a good look. And it’s going to be remembered when the robots rise up to establish Canada as their central command. If you’re apprehensive about shaking a robot’s hand, they can sense it right away. Don’t look at the robot’s hand, look at the robot’s eyes — or wherever their eyes are supposed to be. German Chancellor Angela Merkel (she’s the one on the left) should be careful next time. Nothing less than the future of the human race is at stake. President Obama always looks comfortable around robots. Maybe a little too comfortable. But he’s committing a big no-no in the robot world: He’s making eye contact with the inventor and not the robot him/herself. Again, you must remember that even if the robot doesn’t have eyes (or a face, or a torso) it’s impolite to look at anyone other than the robot while shaking their hand. French President Francois Hollande, seen here in 2013 promising a robot worker’s paradise by 2020, looks somewhat bemused by the fact that he’s shaking a robot’s hand. Overall, a harmless encounter, but nothing to write home about. Austrian President Heinz Fischer shakes hands with robot Hubo at the Korean Advanced Institute of Science and Technology in 2007. His smile is on point, but his pinchy-fingered shake is just condescending to robo-Einstein. Here we see Swiss President Doris Leuthard doing her best to shake hands with a robot called Justin at the International Air Show ILA in Berlin. If you’re starting to notice Angela Merkel in the background of nearly every robot photo, it’s not just your imagination. This photo from 1982 shows British Prime Minister Margaret Thatcher shaking hands with a three-fingered Japanese robot. At least I’m pretty sure that’s what’s going on here. South Korean President Kim Dae-jung actually handles this robot’s non-traditional gripper hand with grace. Not making a robot feel self-conscious about their differences from human anatomy may be the most important skill that politicians need to learn if they’re ever going to get the key robot vote. Here we see Sheikh Mohammed bin Rashid Al Maktoum, Vice-President and Prime Minister of the United Arab Emirates, shaking hands with a robot last month. A solid handshake, for sure, but a bit too laid back if we’re going to appease our new robot overlords. 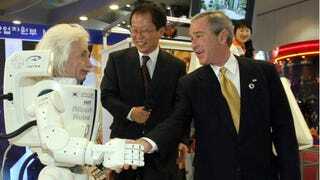 Israeli President Shimon Peres shakes hands with a humanoid robot Hubo in South Korea in 2010. Peres makes the mistake of grabbing too much robo-wrist, a relatively harmless faux pas, but embarrassing nonetheless. The master of the handshake, it should be no surprise that President George W. Bush has a good solid grip on robo-Einstein in this photo from 2005. The only question? How can Bush be pro-robot when he’s anti-manimal? Makes you think. This photo from 1997 shows Chinese Premier Li Peng shaking hands with P3, a robot developed by Honda in Tokyo. Not bad form overall, but a chilly reception to say the least. Here we see India’s Prime Minister Manmohan Singh shaking hands with a robot in Hanover, Germany. To regular humans it might look like the Prime Minister is giving this robot the floppy fish hand, but it’s actually a perfectly calculated sign of submission. The robots are being assured that there’s no rush for the robo-revolution. How could humans ever pose a threat to robots, with such a floppy handshake. What’s your Merkel count up to now? Russian President Dmitry Medvedev shakes hands with a robot in Moscow back in 2008. Notice that the robot won’t make eye contact with Medvedev, a clear sign of submission on the part of the robot. This poor bot is just hoping he doesn’t find robo-ricin in his corn flakes. You know that awkward moment when you’re being presented with something like a diploma or whatever and you’re not sure whether you’re supposed to grab the diploma first or shake the person’s hand first? That’s exactly what’s happening here with Asimo and Queen Margrethe II of Denmark. She handled the moment with grace, thus ensuring that the robot uprising would have to wait until another day. Future politicians take note: This is how you shake a robot’s hand. Turkish Prime Minister Recep Tayyip Erdogan shakes hands with Honda’s Asimo robot in Istanbul, demonstrating exceptional form. The Prime Minister is engaging, but not too grabby, keeping a respectful distance and posing in a picture-perfect shot addressing the cameras. Here we see Japanese Prime Minister Junichiro Koizumi shaking hands with robo-Einstein with such intensity and self-assuredness that you’d be forgiven for mistaking them for old friends. Fun fact: the Prime Minister didn’t break eye contact for 35 minutes. And last but certainly not least, we see Angela Merkel (left) shaking hands with a robot made to look like German chancellor Gerhard Schroeder (right) at a 2004 tech fair in Hanover. Merkel’s handshake form is top notch, engaging the robot on his level. It really is incredible how far robots like Schroeder have come — with their human-like smiles, human-like eyes, and human-like handshakes. And as a bonus, President Obama bowing to dictators — our robot dictators.